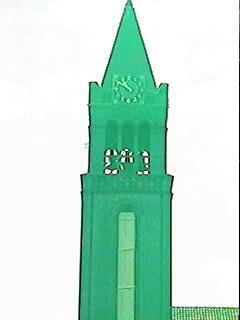 The time shown on the church clock was ten to eleven. 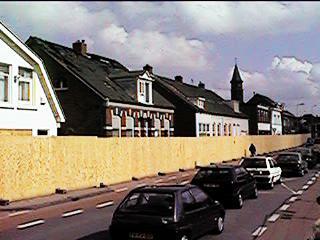 The real time was five p.m. Time in Enschede has been frozen since the explosion. Below the clock the church was shattered, hidden behind the hoardings and plastic put up to protect what is now left. 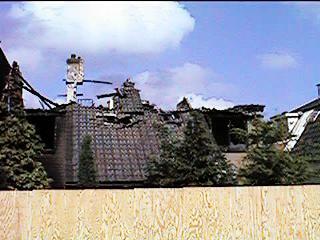 The devastation caused by the explosion was immense. 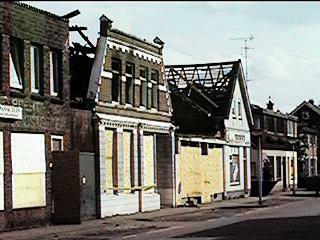 The area looked like something out of World War Two, whole streets of shattered houses, debris over the streets, broken glass, flags at half mast. Everywhere wooden hoardings had been erected to hide the shattered homes. All around there were people looking at the damage, searching for their belongings, or just contemplating the scene. All had one question; how is it that this could happen here? The answer is that they were unfortunate. Someone decided to store a massive quantity of fireworks, with permission but without proper security. It could have been anywhere, but it happened to be here in Enschede. The human toll was massive; around 900 people injured, eighteen dead and another three still missing. It could have been much worse. It had been a hot day and many people had been away for the day. They were returning and then going out again to enjoy the warm evening. 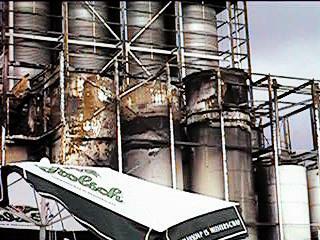 In fact many people were outside when the small fire in a nearby factory caused the first explosion. This was the second event that reduced the deathtoll. 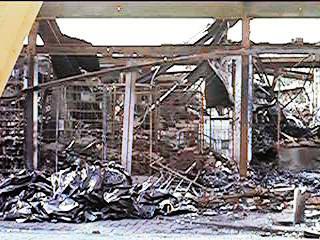 That explosion warned people of the danger and as they got outside to see what was going on. They could then see where the danger lay and that the danger was by no means over. By the time of the big explosions, which caused most of the damage, people had managed to get far enough away to be out of mortal danger. I spoke to Jorg, who had lived some distance away from the factory. He had just returned from a day in the countryside and was just walking his dog before going to bed. He heard the first explosion and called his wife to get away. Together they ran for their lives, but were still floored by the big explosion that followed. Some of the debris hit the roof of their house, penetrated the building and having passed through a bedroom upstairs, crashed through into the kitchen. Just there Jorg’s wife had been standing when he had called her! Now their house, like hundreds of others, is standing empty. They are staying elsewhere and have no desire to return. He wants the council to pull down these houses and to rebuild the district. One can hardly blame him. According to people in the area, the Council had received a complaint about the factory and some local people were suspicious about what was going on inside this ordinary looking unit. No one thought that it might contain such a deadly store. No action was taken and the first most people knew about their mortal danger was the first explosion. Even now the whole incident is shrouded in secrecy. No one will talk about the findings so far. No one will say what will happen to the area after the clean up has finished. 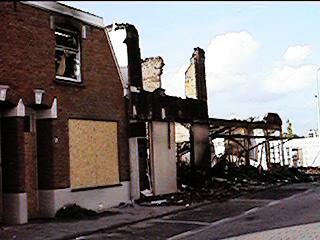 Two men have been caught and are being prosecuted with offences connected with the explosion. Maybe during this trial more information will be made available and people will learn just what went wrong. But at the moment there is no information available. For now the clean up is in full swing, people are trying to get back to some semblance of normality and hoping that one day things will get back to where they were just a few weeks ago. Their hopes are unlikely to be fulfilled; Enschede will never be the same again. Below the clock tower of the church, one window remains intact. 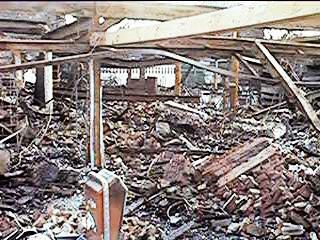 Unshattered by the explosions that destroyed the town. 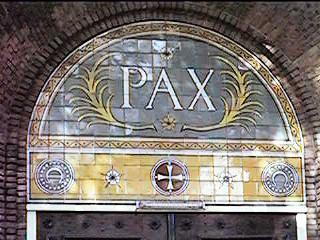 It has one Latin word stained into it "Pax". Peace be with you Enschede, let none of us forget what you have been through.